His aides strike more aggressive tone as the former vice president faces scrutiny over past behavior toward women. 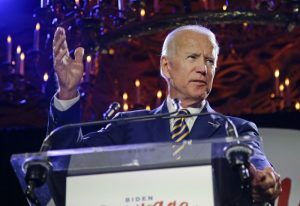 WASHINGTON — Aides to Joe Biden struck a more aggressive tone on Monday as the former vice president faced scrutiny over his past behavior toward women. In a statement, Biden spokesman Bill Russo blasted “right wing trolls” from “the dark recesses of the internet” for conflating images of Biden embracing acquaintances, colleagues and friends in his official capacity during swearing-in ceremonies with uninvited touching. The move came on a day in which a second woman said Biden had acted inappropriately, touching her face with both hands and rubbing noses with her in 2009. The allegation by Amy Lappos, a former aide to Democratic Rep. Jim Hines of Connecticut, followed a magazine essay by former Nevada politician Lucy Flores, who wrote that Biden kissed her on the back of the head in 2014. Lappos told The Associated Press that she and other Himes aides were helping out at a fundraiser in a private home in Hartford, Connecticut, in October 2009 when Biden entered the kitchen to thank the group for pitching in. “After he finished speaking, he stopped to talk to us about how important a congressional staff is, which I thought was awesome,” Lappos said. She said she was stunned as Biden moved toward her. The Hartford Courant first reported Lappos’ assertion. Biden hasn’t made a final decision on whether to run for the White House. But aides who weren’t authorized to discuss internal conversations and spoke on condition of anonymity said there were no signs that his team was slowing its preparations for a campaign.